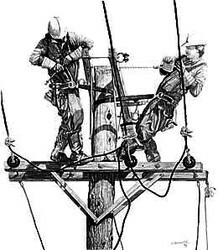 This new electrical power work is more hazardous than telegraph or telephone work because of the risk of electrocution. Linemen may perform a number of tasks associated with power lines, including installation or replacement of capacitor banks, distribution transformers on poles, insulators, fuses, etc. use of ropes, knots, and lifting equipment. Incredible as it seems, live high voltage transmission lines can be worked barehanded. 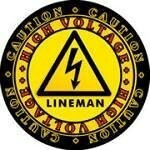 The lineman must be isolated from the ground by using an insulated bucket truck or other method. The lineman wears special conductive clothing which is connected to the live power line, at which point the line and the lineman are at the same potential, allowing the lineman to handle the wire safely. few linemen have the special training to perform it. Barehanded live-wire work can theoretically be done at any voltage, but because better protective means are available for lower voltages, it is only used for transmission-level voltages and sometimes for the higher distribution voltages.